Due to the extensive use of treated wood products throughout urban and agricultural communities, information concerning the environmental and health risks associated with treated wood is very much in demand. Responding to increasing need for a comprehensive and cohesive source on this topic, Environmental Impacts of Treated Wood compiles the latest information concerning regulations, environmental impact studies, new wood preservative formulations, and state-of-the-art disposal technologies available for minimizing environmental impacts caused by treated wood. Beginning with a background of the production of the most common treated wood products, this book discusses how chemical leaching and transport of certain wood preservatives affect the environment, particularly chromated copper arsenate. A separate section is devoted to case studies that evaluate possible links with cancer and other health risks with repeated exposure to treated wood. Several chapters discuss ways to measure exposure and review various approaches to risk assessment and management. 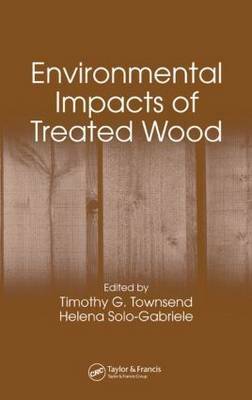 Because treated wood products last a long time, the book also considers the disposal of treated wood in terms of human and environmental impact. It explores novel disposal technologies and practical strategies for complying with regulatory phase-outs of certain treated wood products within the U.S., Canada, Europe, Australia, and many Asian countries. These include recycling, bioremediation, thermal treatment, and landfills. Environmental Impacts of Treated Wood provides a timely compilation of perspectives necessary for making informed, conscientious decisions in the production, use, and disposal of treated woods that will minimize the environmental impact and human exposure risks associated with treated wood products today.